So Tired | So Many Exciting and Beautiful Places! Again, we got up very, very early, in order to catch a flight back to Lima, then on to Santiago, Chile. In Santiago, we boarded a bus to Valparaiso, where we boarded our cruise ship, Crystal Serenity at around 6 pm (actually 8.) Valparaiso looks like it’s almost due south of Lima, but there is a two hour time difference. We found this out when we were strolling on the ship at 6:30 pm (0r so we thought.) We figured we had plenty of time before dinner at 8:30. Then we saw the clock. Yikes! We were already late for dinner, and we were still dressed in our traveling clothes. I didn’t even know where my comb was. Fortunately, our fellow diners were very understanding. We enjoyed some good conversation over a delicious dinner, and then headed to bed. Spent a few hours unpacking, doing laundry and ironing clothing so that we could look more presentable this evening. Tonight was our first formal night, and we wanted to make a little better impression than last night. Spent a few more hours resting. It was so nice to be able to sleep past 6 am for a change. It was fairly windy today and the seas are a little choppy. We’ve been warned that we may be a little late docking at tomorrow’s port as we didn’t get started on time yesterday. Some of the other passengers who came in from Santiago didn’t get here until almost 10 pm. Their flight was later than ours, but I also heard that Crystal staff in California forgot about the two hour time difference between Lima and here. We enjoyed a great show by James Fox who covered several Billy Joel songs, including my favorite: Uptown Girl. The theater was rocking. Fox has had several roles in several musicals, including The Piano Man in the Broadway musical “Movin Out“, based on the career of Billy Joel. 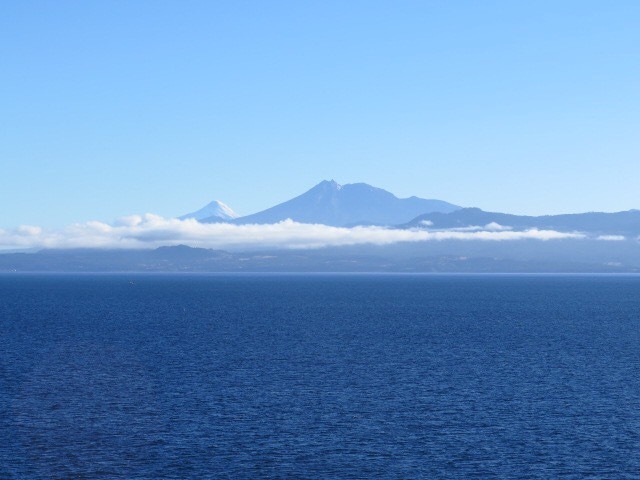 We arrived at Puerto Montt, Chile, at around 10am. This area was first settled by the Mapuche people whose tribes were spread out over a vast area of what is now Chile and Argentina. There was no central leadership, so the Mapuche were able to hold out against the Europeans for much longer than their northern neighbors, the Inca. Chile won its independence by 1810, but suffered through a series of coups and failed reforms. Augusto Pinochet instituted a series of austere policies, and punishment for those who had opposed him. One of my favorite authors, Isabel Allende (related to the former leader of Chile) emigrated to the Unites States to escape his tyranny. Since 1990, Chile has benefited from democratic governance. 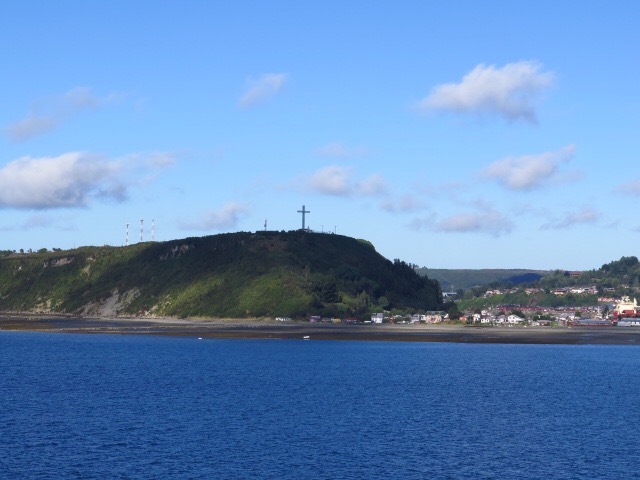 Puerto Montt is situated about 700 miles south of Santiago, at the terminus of the railway and the continental portion of the Pan American Highway a national motorway that stretches from Alaska to the southern tip of Chiloe Island. German colonists arrived here in the mid 1800’s, and their influence is evident in the architecture of the area. 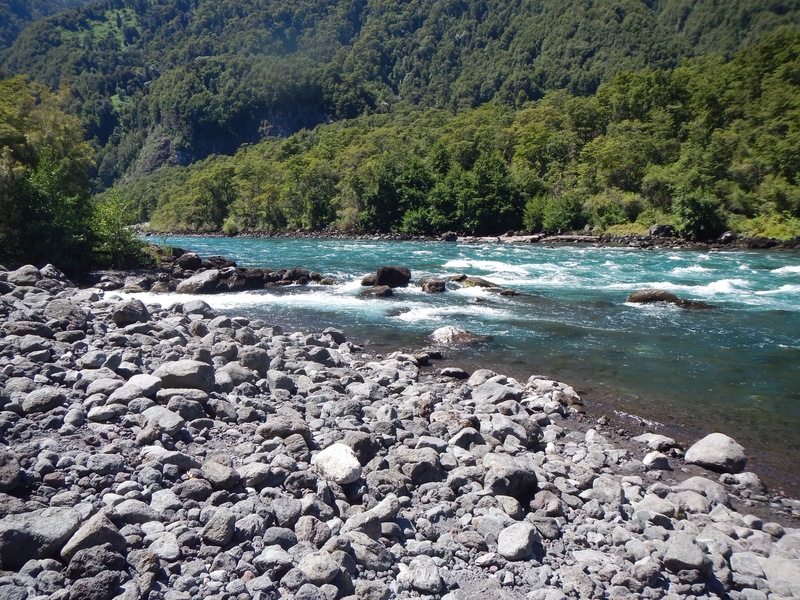 Our adventure was provided by Alsur Expeditions, which has a private base on the Petrohué River. After about an hour long bus ride, partly skirting. the very large Llanquihué Lake, we arrived at the base, donned neoprene wetsuits and boots, jackets, life jackets and helmets, grabbed our paddles and paid careful attention to the instructions given by our guide. The basic commands were: forward, backward, stop, get down, left paddle and right paddle. We were instructed on what to do if we feel out of the raft, or if we needed to help a raft mate get back inside. Fortunately, no one from our raft fell out, but it was certainly close at times. Two people did fall out of one of the other rafts, and I was impressed with how quickly the guide was able to get them back on board. Our raft held 7 people, including 2 guides. This was not a relaxing ride down the river, sitting back and enjoying the scenery. 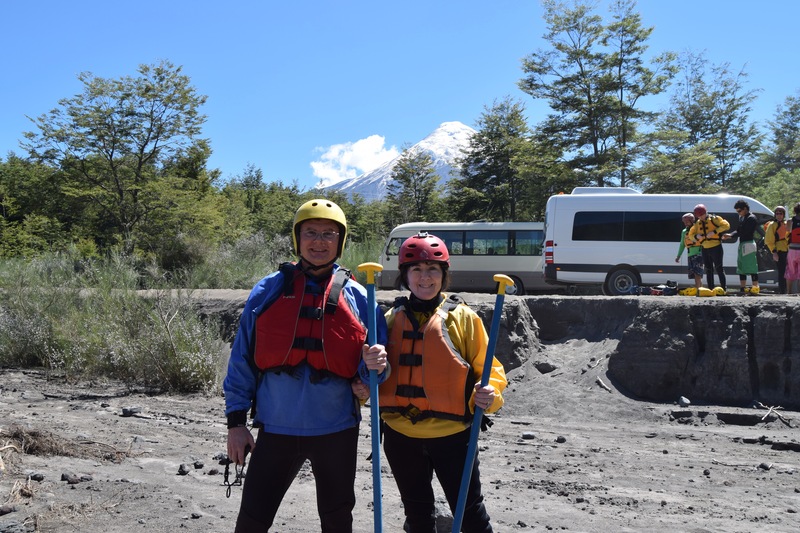 We did enjoy the scenery – great views of several volcanoes, including Calbuco and the glacier capped Osorno – but only during short breaks. We sat on the sides of the raft with our feet braced inside, and went to work as instructed, while one of the guides did the steering in back. 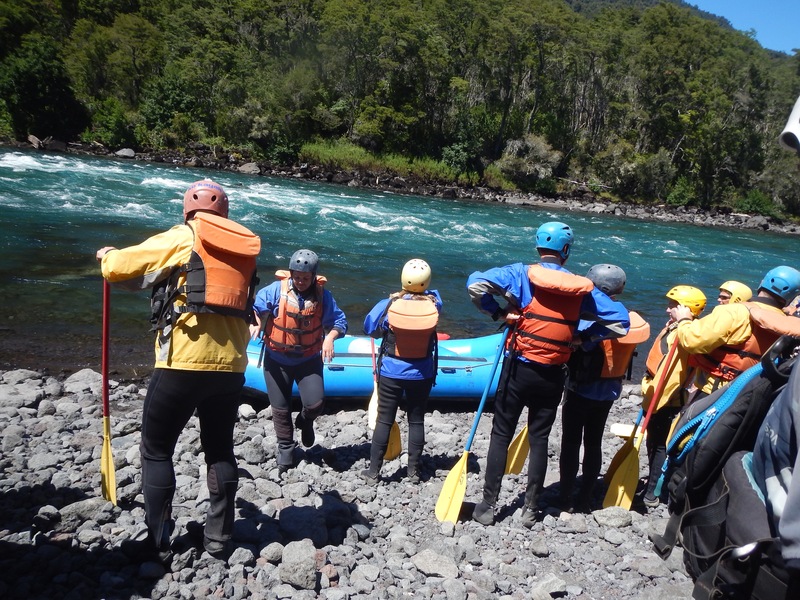 There was lots of paddling and several drops back into the raft as we came too close to rocks. Even though neither of us fell overboard, we were drenched by the end of the ride. We were also exhilarated. Mark took a few photos with the waterproof camera, and Alsur had people on shore taking photos as well. Back at base, we dried off and put on dry clothes. We were treated to a beer and empanada before getting on the bus again. I almost fell asleep on the way back. 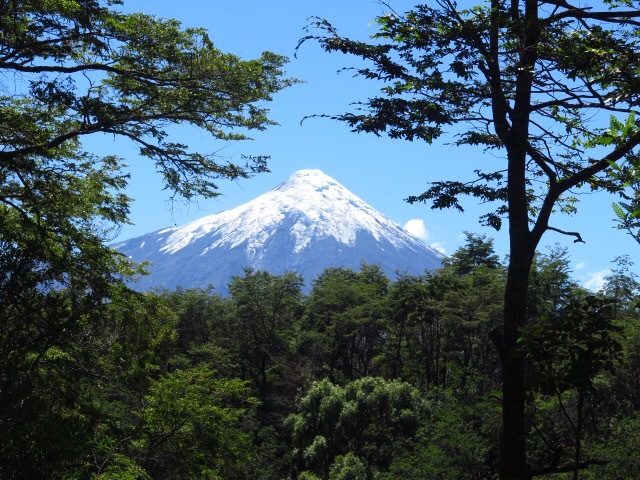 This entry was posted in Chile, Crystal Cruises, South America Travel and tagged White Water Rafting. Bookmark the permalink. 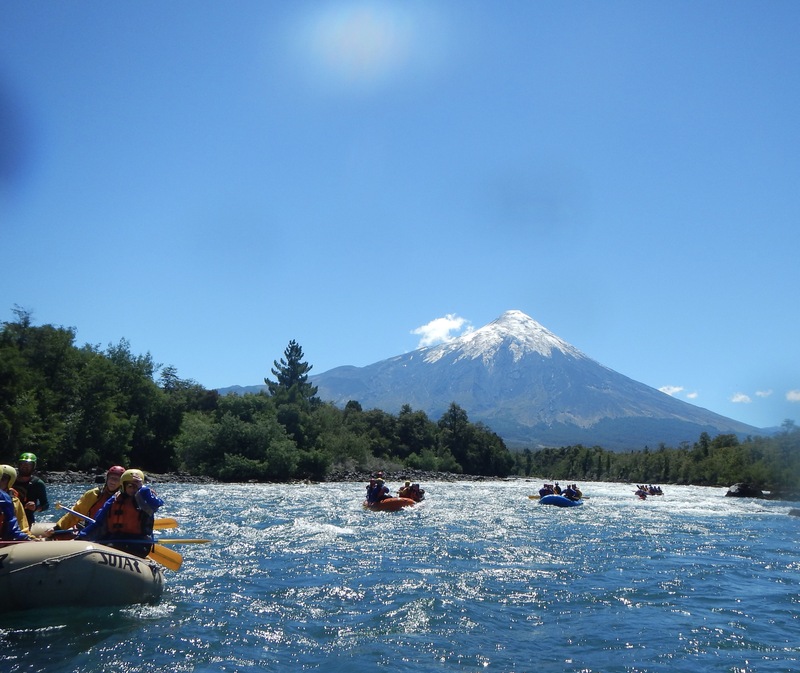 Such a beautiful setting for whitewater rafting. Glad you were able to tick it off the bucket list–your entire trip sounds like an incredible bucket list adventure! I hear you on the ‘Uptown Girl’ love–‘Innocent Man’ provided the soundtrack to my teen years. Your travels are exotic, off the beaten track; always enjoy reading about your explorations.